i think it’s safe to say that most teachers are fans of some type of coffee house. 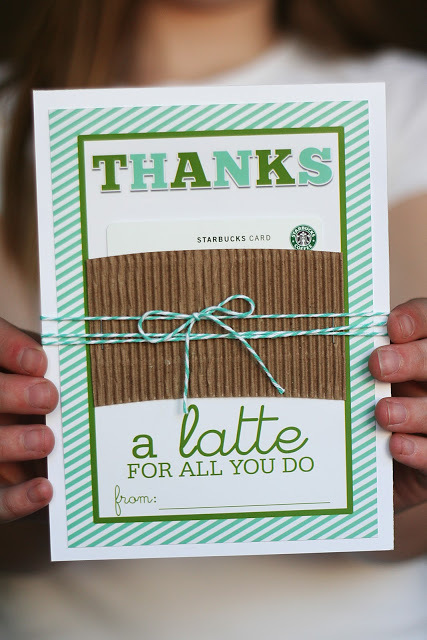 **for extra fun, place the card inside of a paper pastry bag and hand out to all of those well-deserving teachers. Thank you so much for the great teacher gifts ideas. I am so grateful for my daughter's teachers, and think they do a wonderful job. I am excited to make them some gifts with your great ideas! that is darling! I love the latte and the corrugated cardboard holder – yum! This is great, not only for teachers but also for all the friends that help me out! Thanks for sharing! Love it! I'm saving it for future Teacher days! Or maybe an end of the year treat!! Pretty sure this is one of my favorite printables ya'll have done. Totally stealing it to use for gifts. You girls rock my world. I stumbled the post too! I super duper LOVE this card!! Thank you for all of your Darling ideas….I do not have a creative bone in my body, so thanks to you, it looks like I do!! My son's teacher is a huge coffee lover so this is PERFECT for her! Oh man, I could have used that two weeks ago, the PTO at our school bought $5 gift cards from Starbucks for all of the teachers…. and I wrote "for all you do" on all 95 of the envelopes! Man, you guys are sooo smart! Thanks so much for that. It's gorgeous and a great idea. I've got that one locked away for teacher's Christmas gifts. Thanks! So dang cute, thanks for sharing it. This is perfect! I help in my daughter's class every Tuesday and bring her sweet teacher a decaf americano- 2 splendas each week. It's the least I can do for her being so great to my kids everyday! Thanks for the wonderful idea! Thank you so much for this post. I want to let you know that I posted a link to your blog in CBH Digital Scrapbooking Freebies, under the Page 4 post on Apr. 28, 2011. Thanks again. This is so cute! I love all of your printables! What program do you use to create them? What are you printing them on? Card stock? You said you printed yours through Costco. Are you printing this on photo paper? I love Costco, but am thinking I might not know about a service they offer! Thanks so much! I am making the to-do list frame today for my son's teacher. As a teacher myself, I love your ideas! Thanks so much for using my button and for linking up! I featured this today over at Today's Top 20! I tried to print it and it came out closer to 8×10. How can I scale it down? Love it! Thanks for turning a simple gift card into such a fun gift! And not only that, but you've given us a new fun place to go for treats! When we stopped by Starbucks to get ours, we spied the pink cakepops and mini pink donuts…what girl doesn't love that! My kiddos picked going to starbucks over going out for ice cream this weekend! Lol! This is so cute! I get a lot of Starbucks cards from my students for various reasons, but nothing packaged as cute as this. I just made a bunch of these for teacher/nurse/etc gifts. Thank you SO MUCH! When I picked up the prints today, the lady at the photo counter wanted to know what I was doing with them because just the print out was so cute. I sent her to your blog! oh my word – i just spent the last ridiculous amount of time reading every blog post trying to find this particular one!!! 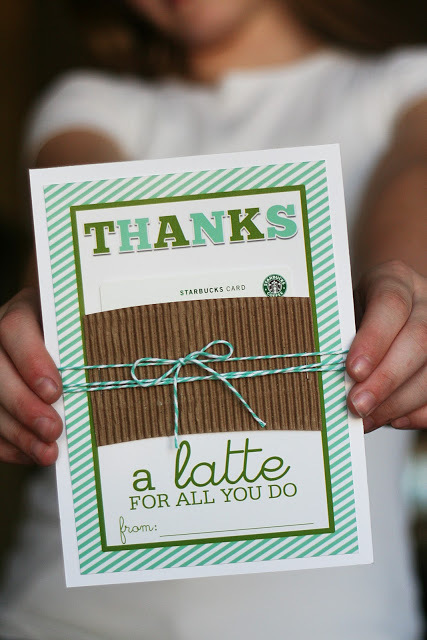 haha, someone had pinned this on pinterest & it's such a perfect, practical, thoughtful 'thank you' gift. so glad i found your blog! love ALL the ideas!!! thanks a million times over for creating this!! Everyone adores them and our family feels great handing these out for any reason. Last year a friend shared this idea with me, but I didn't take the time to figure out where it came from. I love this and want to thank you for the idea. I modified it to work for me but want to say that yours is so much better! Thank you for posting this! I used it for my medical instructor and I'm sure he is going to love it! And, I will use it for our mother's caregiver who gives above and beyond and LOVES coffee! Wonderful, cute idea! Thank you! As always, thank you so much for the printables! They are always so cute! We're using these for Administrative Assisstant day-they're going to love them!! Using this for our teacher gift. Thank you so much, this is perfect! PS I work at a Costco photo lab and we are always commenting on how cute the subway art is that comes through. I finally found you today! We love your stuff! Teacher appreciation week is coming up and We'll be using this for a gift. Thanks sooo much for sharing!!! Thanks for sharing this! My daughter is making it now for her CCD teacher 🙂 God Bless. This is so adorable and practical! I love it. I featured this on my blog, thanks for the inspiration! Thanks for the free printable. This is my second Eighteen25 teacher appreciation gifts I have used. Love it. THANK YOU for the great idea! It was super easy & fun to make. So cute, I actually used the whole sleeve and it turned out cute too !! Taking it to school today as just a little thank you …. great idea, thanks for posting! Thanks a latte for this! I am going to use this idea for each of my staff for Administrative Professional's Day! I think I am going to add in some biscotti to go with. Thanks for the idea!! Something thoughtful without breaking the budget! Using this for my parent volunteers and am attaching them to the $1 reusable cups, as well as note cards I am making with their child's artwork. I linked this idea in the same post. Again, thank you so much!! I have tried numerous times to download this printable, but the link appears to be broken. Is there another way to get this printable Thanks! i've added the download at the bottom of the post. please let me know if it still doesn't work for you. I would love to see this design in fall colors (browns, oranges, reds, yellows) – this would be great for thanksgiving! Thank you, this is perfect! Just finished up recreating these for my baby girl's teachers. great idea and design! thank you! Just finished making these for 11 daycare teacher gifts!! Thanks for the printout!! Happy holidays. What type of cardstock do you buy? I always have a hard time finding something light enough to run through my printer, but heavy enough to feel sturdy for the project I’m working on. Thanks for the great idea! Can’t wait to pass this idea along and use it for another year! How do I download the printable? Is there a specific link?